Members of the KZN 67 Blankets for Nelson Mandela team invite you to one of their regular get-togethers, this time from 09h00 until 12h00 on May 9. 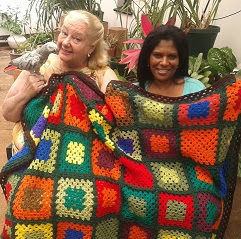 Anyone interested in helping keep the needy warm this winter by knitting or crocheting squares or a blanket, are welcome to join like-minded people at the Wimpy, Pavilion (next to Game) on the day. If you don't know how to knit or crochet, you can learn there and then, and contribute to this amazing charity. Join the 67 Blankets for Nelson Mandela Day Facebook page to join in the conversation.